The chapel and its hall sit side by side at the top of London Road. 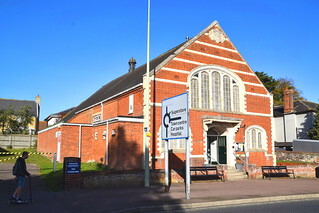 The situation is similar to that of the Methodist church and its hall over the border at Gorleston. The chapel dates from 1877, the hall from a quarter of a century later, but this was of course time enough for fashions to change. The chapel, though a simple red brick structure, has new-classical detailing, a reminder of non-conformism's suspicion of the gothic revival. The hall, on the other hand is in the mode of the turn of the century's non-conformist flirtation with the Arts and Crafts movement. Before building their own chapel, the Halesworth Methodists had camped out in an 18th Century independent chapel, vacated by its congregation in 1836 as too small for their purposes. 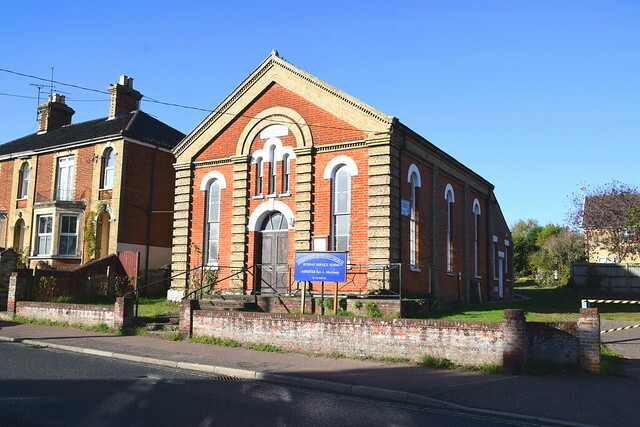 The capacity of 170 was more than roomy enough for the Methodists at the time of the 1851 Census of Religious Worship, but Methodism was one of the growth denominations of the century, especially in rural Suffolk, and so by the 1870s the Methodists ventured a building of their own. And there it is still today.